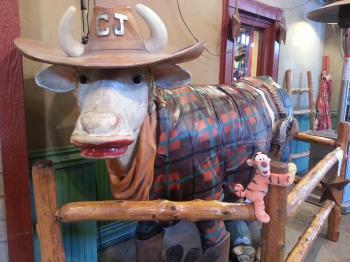 There's no place in Texas like Fort Worth's Stockyards Station: Tigger takes some Brittish friends for a REAL Texas experience! 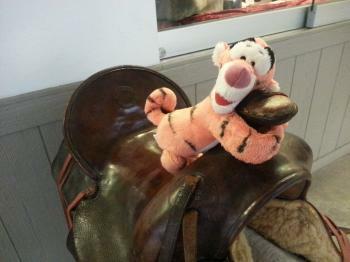 Tigger Travels - Family Adventure Journal Photos From Tigger`s Travels and MORE! 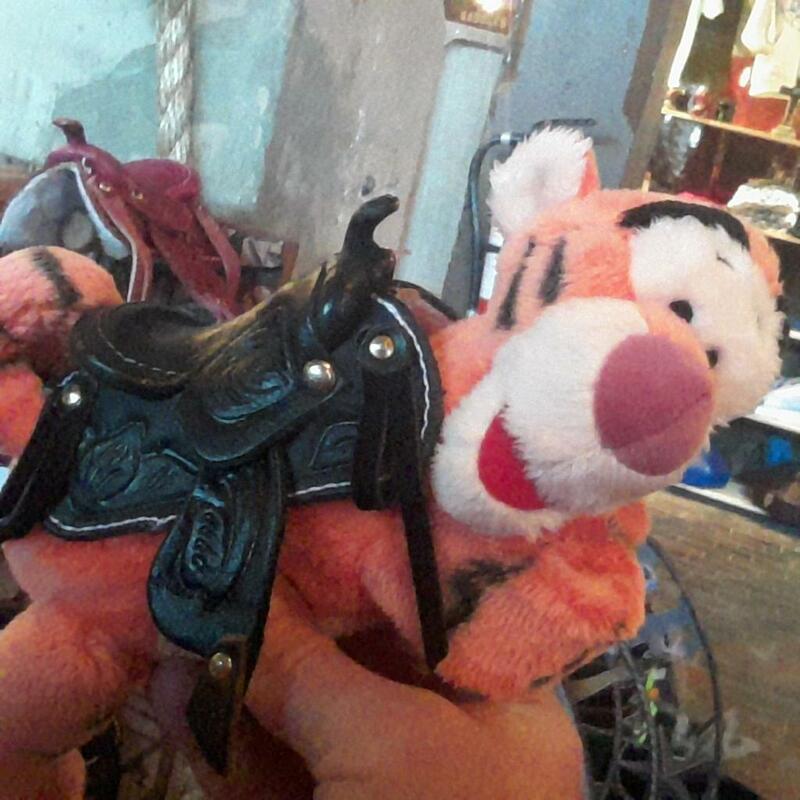 Tigger trying on a new saddle! ...Wait... is that right?? 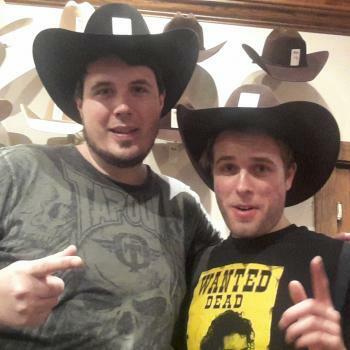 Joe and Jack sporting over a thousand US Dollars of hat! 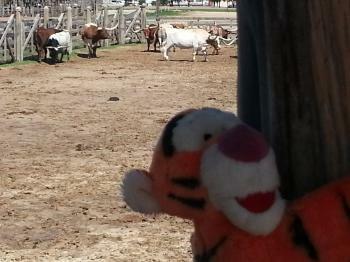 Tigger poses with the herd at the pens. That is more like it!! 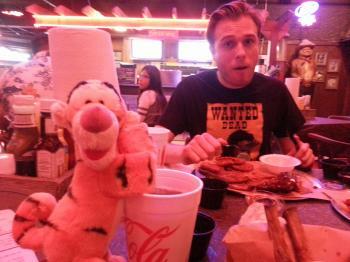 Good friends of Tigger Joe and Jack traveled from their home in Southern England to meet Tigger in Texas for a REAL Texas experience that included food, shopping, fun and more!! Early in the planning stage, though, Tigger KNEW that such a trip had to include the Fort Worth Stockyards Station! One can spend a whole day wandering the immediate area on foot. There is parking located throughout the area if you are driving. At the east end of the several block area is the old stables now filled with shops, restaurants and galleries that offer a fun meander in a very unique environment! 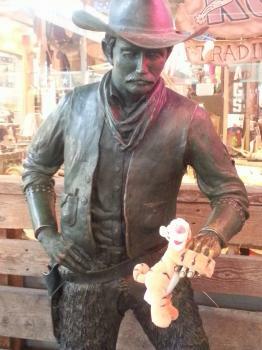 There are old fashion candy stores, saddle shops, general stores filled to the brim with unique Texas foods, jewelry, clothing and oh, so much more!!! Across to the north of this area is the Cowtown Cattlepen Maze. Whether you send the youngsters in to get lost and blow off extra energy or just try to find your own way through, it is loads of fun to read the humorous signs along the way. Explore them all if you can! 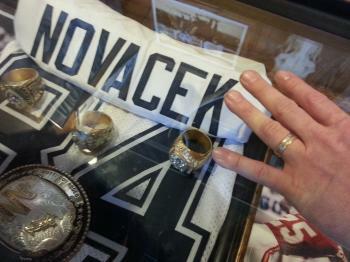 While you are there do not miss the Texas Cowboy Hall of Fame where there are exhibits honoring all types of Texans! From football to funny comedians, side shows to public leaders there is just so much to see! Along the Texas Trail of Fame you will find their version of the Hollywood Walk of Fame with Bronze Stars that are ceremonially placed in the walkways of the whole district.... currently 116, find them all if you can! 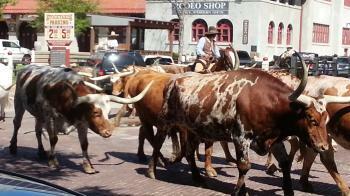 One of the fun things to see is twice a day (11:30 am and 4:00 pm daily, weather permitting) the Fort Worth Herd go on a Cattle Drive around the Livestock Exchange Building. Between drives the herd can be seen behind the exchange in their pens. 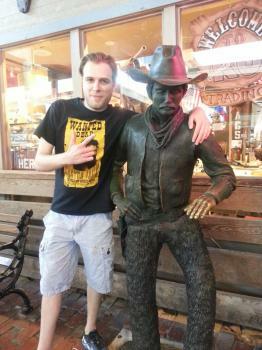 At the west end of the Texas Cowboy Hall of Fame is the heart of old town with even more! 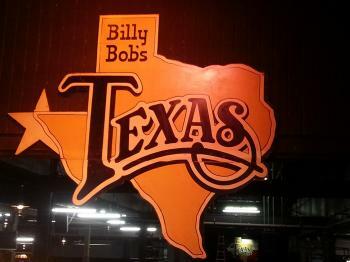 Be sure not to miss eating at Billy Bob's Texas the largest Honky Tonk on the PLANET! !